Two Slides Computer NC Type. Vertical type, slim design,easy for operation and maintaining. Different models: Fixed bottom, Single & Double slide rotary table, L Shape double slide(patent),Rotary table,Two colors injection rotary table for meeting your requirement. Different control systems: Relay control, new 201 type PC program control system, pressure proportional, pressure & flow proportional, LCD monitor control, Safety device for operator. 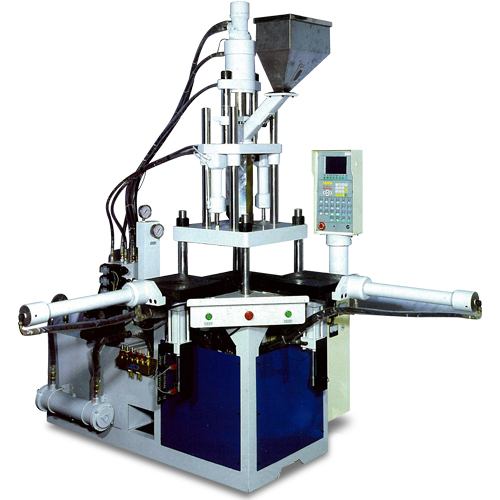 Adopting straight pressing model with high low speed, low pressure open. Mold close protecting the mold include multi temperature control and accurate injection,stable production, easy adjustment. Established in 1985, we could follow your special asking to meet all your requirements.